The counselors at Thousand Oaks High School believe that all students can learn and achieve and have the right to access and participate in the school counseling program. We believe in a holistic approach to school counseling that includes collaboration with multiple stakeholders in a student’s life and addresses and appreciates the uniqueness of each student. 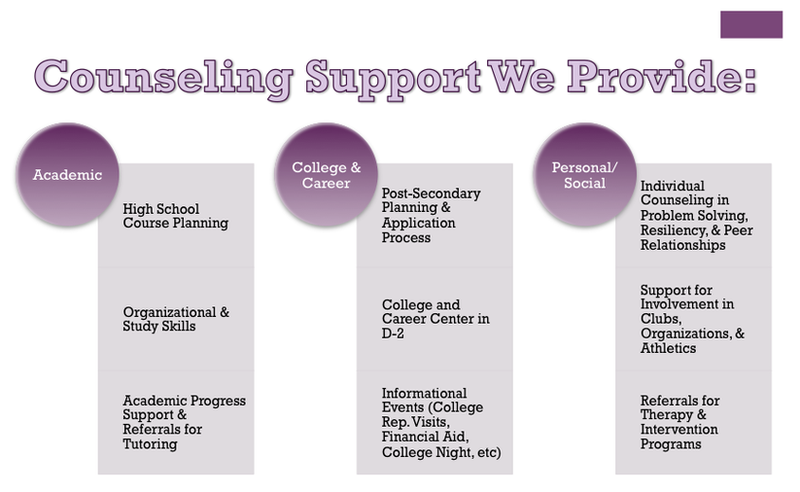 Our school counseling program is preventive in design and developmental in nature in order to provide direct academic, college and career, and social-emotional services to all students with additional services and supports to those who need them. We focus on the needs of our students within our school to shape them into academically sound 21st century learners and responsible members of our community within our global society. Counseling Philosophy: I would say my life philosophy is that everything happens for a reason, as cliche as that sounds, but I've found it to be true. Everything that occurs leads us down a certain path and how we deal with these twists and turns is what make up our life story. Having said that, I would also say to know that you can ask for help and there are so many people who can support you. Asking for help in times of need is the most courageous thing a person can do. As a counselor, I am here to support my students with their life journey and help them to successfully navigate high school. From Valley Girl (best 80's movie ever!!!) - Nicolas Cage says it in reference to a girl staying in the car because she doesn't want to get out because they are in Hollywood and she thinks it's dangerous. He says to her "okay but when they attack the car, save the radio"... Then of course, she gets out. It's funny. Interests: Anyone entering my office knows I still have a bit of whimsy in me. I love 80's movies and music, Disney, Barbies, Paris, and pop culture in general. I'm a huge NKOTB fan and proudly say I've seen them in concert 6 times (5 times as an adult). :) I love hanging out with my family and doing things with them, such as going to the beach, going to Disneyland, going on a road trip in my husband's Jeep, or just playing in the backyard. I love watching NFL football and gladly sit around all day Sunday watching Direct TV rooting for my team, which right now is both the Colts and the Broncos. I love to read and do creative things, like decoupage when I have the time. My mom is probably my best friend and we do a lot of fun things together, but I also love just hanging out with my boys - my husband and two sons. Counseling Philosophy: My counseling philosophy is to utilize solution focused school based counseling techniques, alongside emotion focused counseling techniques to help empower and support student success both academically and social-emotionally. I find it rewarding to be able to help students process and recognize what they are feeling. Once students are more aware of what is occurring within them emotionally, change begins to occur and students can begin to form new habits that will help them reach dreams, goals and ideas they may not have believed were possible. This transformation is so wonderful to see and would not be possible without the support of teachers, parents, friends, and/or a trusted adult on campus. My advice to students would be to get connected to something, if you’re not already! Whether you’re connected to a club on campus, starting your own club, or are involved in a sport or program, the benefits of being connected to something on campus are so great! Take control of your life and make high school what you want it to be. Counseling Philosophy: I truly believe that every student can obtain their personal goals. It takes dedication, perseverance, and hard work on the part of the student, and it’s my job to create the path, so the student can see the steps they will need to take in order to achieve that goal. My advice to students it to, one, find your passion. Our passion speaks to us within, it’s always been there, we just have to have the courage to listen. And two, not all things come easily in life, it is natural to fail, and it takes a resilient human being to pick yourself up, and continue to move forward in order to accomplish something great. Interests: A few of my favorite things are music, dancing, traveling, and eating ice cream.